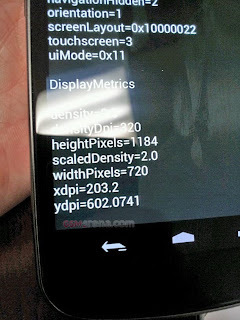 Screen size and pixel density revealed ahead of next week's Nexus Launch? GSMArena is reporting today that they have received a picture of a Nexus "Prime" with display metrics. As you can tell from the picture the resolution aligns with the rumoured 720p resolution. At 320DPI this pretty much confirms a 4.3-inch screen and not the 4.5/4.6 previously reported. Also interesting from the picture is the three in screen Back, Home and Search buttons. The wait will come to an end next week when this year's Nexus is unveiled.